Keep your pc's, network and data secure with best of breed industry standard security products..
Bitdefender Endpoint Security is an easy to use business security and management solution, which delivers superior proactive protection from viruses, spyware, rootkits, spam, phishing and other malware. The centralized management ensures consistent security policies, website access and application controls, audits and other remote management scripts to further improve the productivity. Antispam Using constantly updated blacklists and whitelists of known Spam sites, Bayesian learning provides another layer of detection that adapts to the changes made by Spammers to bypass static Spam filters. Antispyware Bitdefender Client Security detects and prevents known spyware and adware by using five different filtering methods to monitor the registry for modifications, file scanning, cookie control, URL filtering and content inspection to prevent outbound data leakage. Antiphishing While considered more of personal threat than a corporate threat; phishing sites can also harvesting information from your companys employees. Using a combination of constantly updated blacklists and whitelists, Bitdefender prevents users from known accessing phishing sites and preventing compromise. 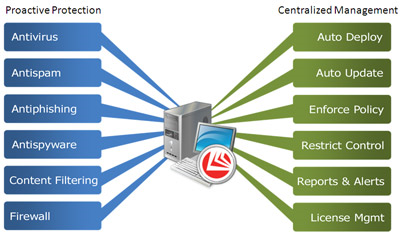 Content Filtering Content filtering allows for the detection of predefined information such as credit card or account information, report names, client databases, etc. from passing outside the companys control. Firewall When users roam or work remotely using unsecured wireless networks, they are no longer protected by the companys perimeter firewall. Granular settings such as Internet blocking and access by IP address, application, port or protocol allows flexible configuration options while maintaining maximum security against inbound and outbound threats. The security requirements for any new or awake 2012 company no matter how large or small - should be the same. While protecting your companys intellectual property and securing customer data are good business practices, the impact of any virus outbreak greatly affects the companys operational efficiency and can incur lost productivity from the workforce. This loss of productivity can cripple a small company and at best, hamper the companys growth. The answer to data loss and lost productivity from malicious malware is proactive protection. Companies can effectively protect their business clients from attack by using Bitdefenders ability to detect and prevent known and zero-day threats, ensure compliance to corporate security policies and manage them effectively with fewer IT resources. Stop malware with fast scanning, built-in intrusion prevention and live cloud-based protection technologies. We protect Windows, Mac, Linux, UNIX and virtualized computers. We’ve integrated essential web security into our Endpoint agent. It blocks the latest web threats and keeps your users safe from malicious sites. Our Web Filtering in Endpoint makes it easy and affordable for you to set a smart surfing policy for the top 14 most inappropriate site categories right from within our console. Our integrated encryption secures your computers with military standard, AES-256 bit full-disk encryption for both PCs and Macs. Included in our Complete Security Suite and Data Protection Suite. Our device control technology is built into Endpoint Protection. It helps you reduce the risk of data loss and malware infection by giving you control of removable devices like USB keys, drives and wireless networking devices. Our unique and simple approach to data loss prevention integrates scanning for sensitive information into our antivirus engine. We help you control thousands of applications that can cause security or legal problems, like P2P or instant messaging. And, we provide the list of applications so you don’t have to. Our Endpoint Patch Assessment identifies, prioritizes and scans for critical threat-related patches—and it’s integrated into our Endpoint console. Our Client Firewall protects your entire enterprise. It blocks worms, stops hackers and prevents intrusion. Our Network Access Control (NAC) checks computers accessing your network—even those not owned by the company—to ensure full compliance with your security policies. Our Enterprise Console makes managing your security easy. You'll know what's happening on your network and you'll have control over it.